We are proud to announce the release of a nationwide Swedish contour map, based on the full high-resolution (2m) national elevation model. It is available for immediate viewing and download in SCALGO Live for all SCALGO Live Sweden customers. The contour map comes in different equidistances are is designed to be cartographically pleasing and have a manageable size, and at the same time provide hard guarantees on how much each individual contours deviates from the elevation model in the z axis. 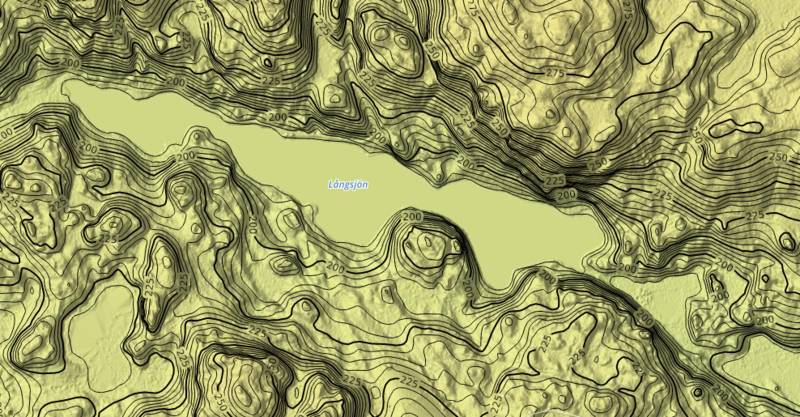 The map has been generated based on the SCALGO technology that was used to generate the national danish contour map. 2.5-meter contours around Långsjön, Sweden. 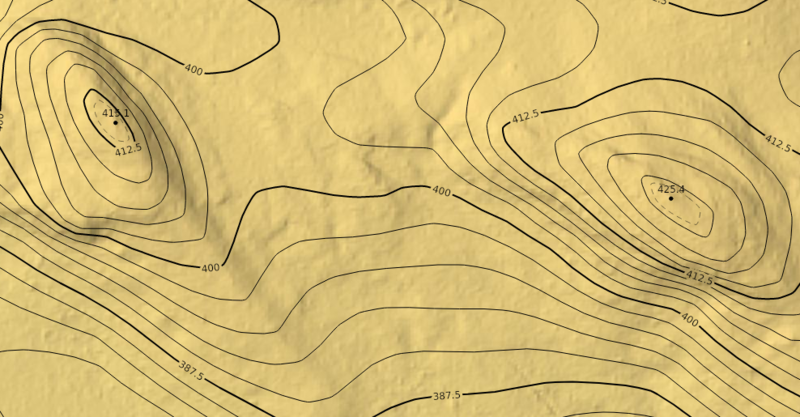 The contour map is available in versions with an equidistance of 2,5 meters, 5 meters and 10 meters. The elevation of a contour is guaranteed to not deviate more than half the equidistance from the underlying point in the model. SCALGO Live will dynamically choose an appropriate version for viewing and download based on your zoom-level. At higher zoom-levels a subset of the 10m dataset is shown (if you zoom out really far the contour map is not shown). The contour map is enriched by a set of extremal points. Those are points that are at the top of a hill or at the bottom of a depression. Each such point is annotated with the elevation value at that point. The extremal points are only shown at detailed zoom-levels and are available in a separate layer. 2.5m contours near Långsjön, Sweden with extremal points marking the peak elevation of to hills. The contours are available in the library which is accessed by clicking the big button in the bottom left inside SCALGO Live. Once open look for the Contours category and enable them from there.